Performers include: Fran Drescher, John Michael Higgins, Tichina Arnold, Rita Moreno, Valente Rodriguez, Robert Walden, and D.W. Moffett. Fran Lovett (Drescher) is the owner of a small florist company in Los Angeles, Frantastic Flowers. One night, she gets the shock of her life. Fran’s best friend and husband, realtor Peter Lovett (John Michael Higgins), admits to himself and to her that he’s gay. Their marriage of 18 years ends but, because of their financial situation, he can’t afford to move out. Fortunately, they both have the emotional support of their family and friends; Fran’s best friend Judi Mann (Arnold), flower delivery guy Cesar (Valente Rodriguez), and Fran’s parent’s, Dori (Rita Moreno) and Glen (Robert Walden). Fran and Peter figure out how to be “happily divorced,” but with her being single and his being gay, while living under one roof, is a whole other story. The series is co-created and written by Drescher and her ex-husband Peter Marc Jacobson, based in part on their own marriage/divorce and his eventual coming out. After a shocking kiss from her annoying neighbor Neil, Fran quickly flies to London to see her fiancé Elliot. She finds two girls sleeping in his hotel room bed and almost believes his suspicious explanation but Joan Collins sets her straight. She gives back her engagement ring and flies home. Fran gives Neil the diamond earrings from Elliot to pay off her $40k debt and lets him know that she’s not interested in him at all. Peter reassures Fran that she’ll find someone else and the two reminisce about their wedding day by recreating their crazy first dance. What do you think? 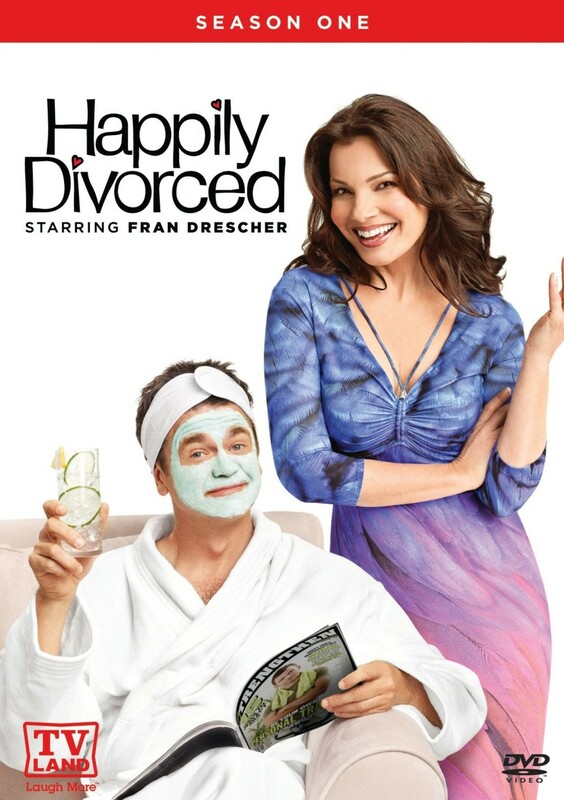 Do you like the Happily Divorced TV series? Do you think it should have been cancelled or renewed for a third season? More about: Happily Divorced, Happily Divorced: canceled or renewed? I am so upset this show was cancelled.Fran is my favorite actress,next to Lucille ball.I mean they two peas in a pod.how could there be high ratings for all of these fake reality shows.I miss family shows that have silly comedy with a vast series of family problems that always get solved by the end of the show. I think the show was great and I am upset to see that TVland canceled it after only 2 seasons. I mean hell Hot In Cleveland gets renewed for 100 seasons and they wont even do a third for Happily Divorced. Bring it back. Great show! WHAT WERE THEY THINKING CANCELING IT? It was a great show! I hope someone picks it up. I LOVED LOVED this show .I can not believe it was cancelled. Very funny. Very entertaining. The whole cast was awesome!!! BRING IT back!!!! PLEASE!!! A funny show with a GREAT CAST, we’re gonna miss you guys. TVland is a bunch of boneheads. they should bring the show back – I am sick of Raymond show and the other new shows on TV land are not that great, especially the show with the four women in Happy in Cleveland, or whatever name of show is – the one with Betty White, and I love Betty White and Valerie B, but just can’t stand the show. I never liked Fran in her other show, but was surprised when this new show came on and really liked it. They should renew Happily Divorce, and stop bring on who loves Raymond so much.